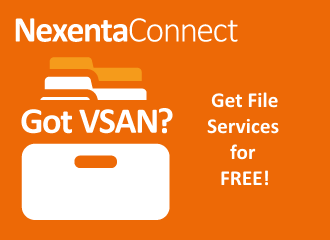 Current VMware Virtual SAN customers can now get File Services free of charge!, courtesy of VMware & Nexenta. When you are using VMware VSAN and you want to put your ISO images on VSAN you can’t at the moment. With NexentaConnect for VSAN you will add enterprise grade file services on top of your VMware VSAN deployment. Also if you would like to connect your other ESXi servers without VSAN and the VMs running on top of that cluster on your VSAN cluster, you now will have that possibility. NexentaConnect for VMware Virtual SAN is a software only solution delivering full-featured file services for VMware Virtual SAN environments by adding NFS and SMB access on top of an existing Virtual SAN cluster, simply managed through vCenter. As such, NexentaConnect for VMware Virtual SAN is a great complement to any VMware powered hyper-converged infrastructure. 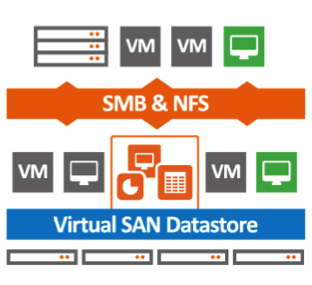 NexentaConnect for VMware Virtual SAN is designed for VMware VSAN environments to simplify and streamline provisioning and management of file services on top of VMware’s Virtual SAN scale-out datastore. 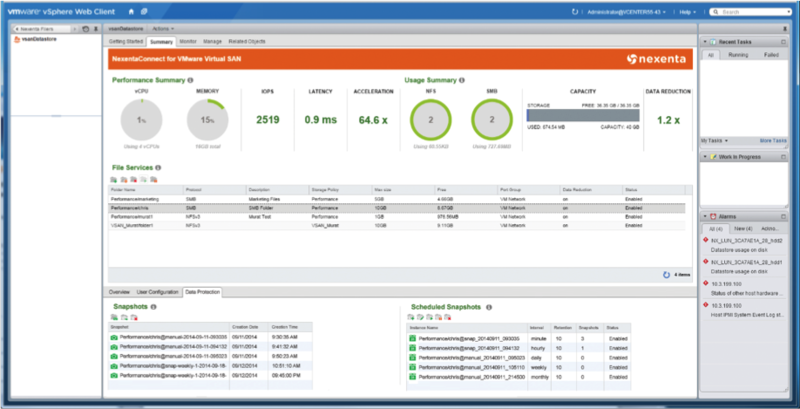 NexentaConnect for VMware Virtual SAN can be deployed with any Virtual SAN deployment. Common uses cases include generic filer replacement for smaller environments, storage for user profiles for VDI deployments, departmental data for test/dev solutions, and iso storage for management clusters. The management of NexentaConnect for VMware Virtual SAN fileservices is done through the seamless integration within vCenter Server. All management and administration are done through a simple dashboard fully integrated in VMware vCenter Server. 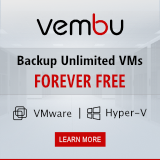 How do you get NexentaConnect for VMware Virtual SAN? You will have to provide proof of your current licensing with VMware VSAN. Just follow the steps on this web page to Sign-up. It is a 2 step process. You supply proof of your current VMware Virtual SAN purchase and follow the 2 step process on the webpage. This two steps includes supplying your business information and download and install NexentaConnect for VSAN. After the installation return to the web-page for step 2 to create and collect your complimentary License key. Limited time only! Proof of purchases of VMware Virtual SAN with the appropriate number of CPU sockets purchase clearly provided. 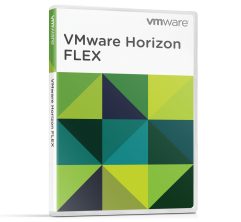 NexentaConnect for VMware Virtual SAN will be licensed to match this purchase. 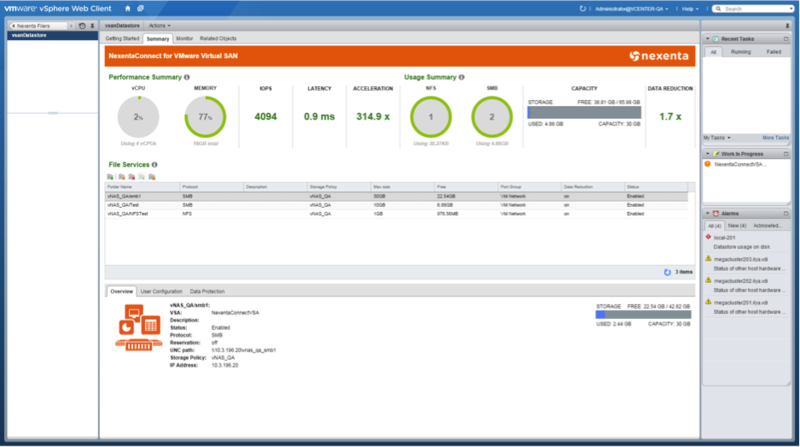 To know more about NexentaConnect for VMware VSAN take a closer look at NexentaConnect for VSAN by Cormac Hogan in his blogpost: Closer look at NexentaConnect for VSAN.